Capture the beauty of the Christian faith with this cross pendant from Apples of Gold. 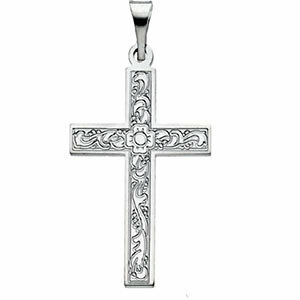 Inspired by nature, this 14K white gold cross pendant features a single flower in the center of the cross. This four-petaled bloom sets a natural tone for this cross pendant, and each arm of the cross echoes that motif. They are adorned with leaf-like shapes that are carved with care into the gold. The pendant is bordered on all sides with a smooth edge to complete this natural beauty. We guarantee our Small Floral Cross Pendant 14K White Gold to be high quality, authentic jewelry, as described above.